The Beauty Buff Blog: Working Wednesdays-Speedy Smoky Eyes Courtesy of Tina T! Working Wednesdays-Speedy Smoky Eyes Courtesy of Tina T! Many of us have fun, fabulous evening plans but are on serious time crunches and can't seamlessly transition day/work makeup or no makeup into a sultry smoky eye without some seriously concentrated time and effort spent at home. Or perhaps you think you need a drawer full of cosmetics to really look like you're ready for a night out on the town. Not the case. You simply need a few beauty basics that you can toss into any purse or clutch to look like the most glamorous version of yourself. Mariska Hargitay had amazing smoky eyes at the Oscars this year but she also had amazing celebrity makeup artist Tina Turnbow on hand to give her a flawless face and gorgeous glare. Since Turnbow can't get us glammed up for all of our evenings out, she doled out some fantastic tips and recommendations for throwing together an easy, but unmistakably gorgeous smoky eye. Portability is key and the makeup artist recommends carrying a variety of blendable, lasting and eye intensifying pencils. Turnbow suggests smudging 2-3 different pencils together instead of dealing with shadows that tend to fall on your skin and are messy to carry around. Pencils have a smudgier effect and a more deep, intense color. You'll want a matte pencil (usually in the darkest shade) to accentuate your eye, a super smudgey pencil that acts like a shadow, a highlighting pencil with a shimmery finish to blend the dark edges and brighten the whole look and a kohl pencil to line the inner rims of your eye if you're feeling particularly dramatic. Smoky eyes can seem intimidating but what they do is enhance your natural eye shape using dark and light shades to play up one part and darken another. Turnbow says, "You want to emphasize darkness around the lash line and then diffuse that color out with a complimentary highlighting shade to make the eye pop. A soft metallic shade will give your eye dimension and depth." 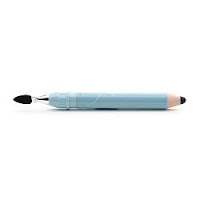 To recreate Hargitay's sultry stare, Turnbow recommends starting with a solid matte pencil in a midnight blue hue. 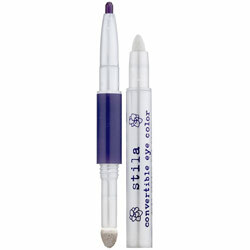 Try Sue Devitt Eye Intensifier Pencil in Victoria Falls or Stila Kajal Eye Liner in Sapphire. Both pencils blend easily, glide on smooth and are long lasting. Take the dark shade and follow the shape of your eye closest to your lash lines. Trace the pencil around your eye into an almond shape, which is the ideal shape for smoky eyes. Take another soft color like Stila Convertible Color in Indigo (a dual-ended color wand that has a pencil on one end and a complimenting highlighting shadow with a blending applicator on the other) and smudge the hue in the crease of your eye as a background to the darker color. 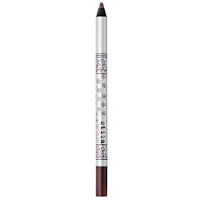 Then add in a shimmery metallic color like Sephora Collection Nano Eyeliner in Precious Silver or Pure Beige. Take the iridescent pencil and use it to highlight the shape of the eye to give it a luminescent look. Highlight the center of the lid (above the dark liner) and add a touch to your inner eye corners. Let the darker color graduate to the shimmery edge, so the lines are blurred and cloudy. Blend, blend, blend! Make sure there are no defined edges or lines. Turnbow says a harsh line will make your eyes look smaller. For an even more dramatic look, focus a darker kohl pencil on the inside of your eyes to bump up the look. 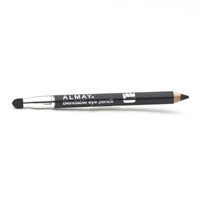 Try Almay Blendable Eye Pencil in Brown or Black. Hargitay's smoky eyes looked stunning and the beauty's smooth chocolate brown pupils melted against the blue hues. You can easily achieve a similar look with Turnbow's amazing suggestions! Blue smoky eyes are perfection for the Spring and look amazing on every skin tone. So grab a few of these pencils, store them in your bag and whip them out when you're ready to boost your look to the next level. Enjoy!! Also check out the amazing Flower Child collection from Tarte inspired by eco-friendly makeup Goddess Tina T! Available at Sephora for a limited time! 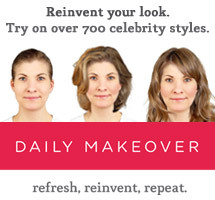 Check out Makeover Momma for my Working Wednesdays columns! LOVE IT AND CAN'T WAIT TO TRY IT! Where do you recommend shopping for eyeliners and stuff? Sephora? Somewhere online? I want all the pencils you just mentioned!!! Colored eyeliners are everywhere but pencil quality is actually super important because you dont want something that will pull at your delicate skin around the eye. Sephora brand pencils are great if you're not ready to commit to a brand like Stila. I also love www.Beauty.com. You can combine a drugstore.com order (if you want to stock up on drugstore necessities) and that way you can easily spend the minimum $25 on things you need and want! Or you can be like me and spend $25 on just beauty products! PS I will definitely put together a how-to video on wearing colored pencils asap! Brown eyes can wear so many different shades. It's just a matter of finding the right shade and applying to fit your eye shape. Trust! Thanks so much for your comment! Let me know if there's anything else you'd like to see on the site. My how-to videos are coming soon and I'm happy to cover any and all beauty-related topics!